Iran’s aggressive military posture is often attributed to its quasi-theocratic revolutionary government. However, the Middle Eastern state also had the misfortune of experiencing three devastating, unprovoked invasions in the 20th century. The last and best known of these, the Iran-Iraq War from 1980 to 1988, killed hundreds of thousands of Iranians, many of them civilians. Iran eventual defeated Iraq despite both the United States and the Soviet Union supplying weapons to Iraq. The first Iranian invasion occurred near the end of World War I. The state — then called Persia — remained neutral in World War I, but that didn’t prevent British, Russian and Ottoman armies from entering Iran to seize its oil, food and roads. British and Russian soldiers confiscated most of Iran’s grain, as well as the pack animals they used to transport it, causing a famine of near-genocidal proportions. Combined with epidemics of typhoid and influenza, food shortages killed at least two million Iranians. The World War I famine fatally destabilized the Persian Qajar dynasty. Georgian Cossack officer Reza Shah overthrew it in 1921 in a British-backed coup. Like the Turkish Ataturk and the Chinese Kuomintang, Reza believed Iran had to modernize rapidly to avoid exploitation by Western countries—as well as by the burgeoning Soviet Union next door. Reza still had to accept the Anglo-Iranian Oil Company and its Abadan oil refinery, from which Iran received a mere 10 to 16 percent of the revenue. However, that income did help the Shah finance the 50-fold expansion of Iran’s road network, the construction of a trans-Iran railway and the widespread introduction of motor-vehicle transport. The dictator’s pride and joy, though, was the Iranian military, which with conscription increased from 22,000 to 126,000 personnel by 1941. The Shah also founded a fledgling air force and a small navy. Iran’s modernization required extensive foreign technical expertise. Not wishing to increase Iran’s considerable dependency on the British, the Shah contracted personnel from the German Junkers company. By World War II, between 600 and 1,000 German citizens lived in Iran, many occupying important positions in the communications and transport sectors. Though the Shah remained neutral in when World War II broke out, London remained suspicious of his cordial relations with Berlin and demanded the Shah expel all German citizens, whom the British over-estimated to number 3,000. Not only did the United Kingdom relie upon the eight million barrels of oil annually that the Abadan oil refinery produced. Nazi Germany also needed that oil. However, the more pressure London put on Tehran, the more Iranian public favored the Germans over the British. Two developments in 1941 stoked British concerns. First, a short-lived pro-German coup in Iraq in April-May 1941 threatened to give Hitler access to vital Middle Eastern oil fields. Then, Nazi Germany’s invasion of the Soviet Union prompted the United Kingdom to ship vast quantities of military equipment to the beleaguered Red Army. However, German U-Boats and bombers sank much of the war material in transit across the Arctic Sea. The Trans-Iran railroad offered a convenient alternate supply from British Iraq to Soviet Azerbaijan—but German technicians administering the railroad refused to give the British access. In July and August 1941, London issued ultimatums demanding the Shah expel the Germans. He refused. Reza instead reinforced his troops in the southwestern Khuzhestan region, location of the Abadan refinery. By then, Winston Churchill and Joseph Stalin had agreed to secure Iran by force. Though the United States was not yet a belligerent in World War II, Churchill green-lit the invasion with Pres. Franklin Roosevelt while drafting the Atlantic Charter in early August. 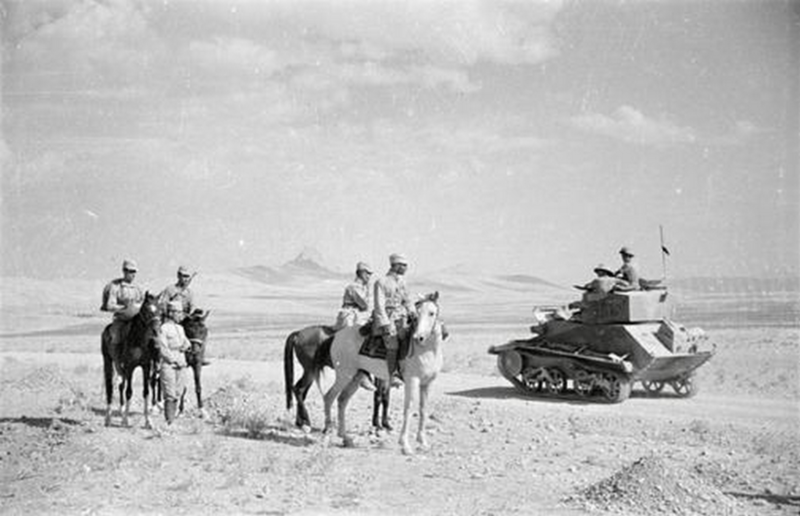 The Imperial Iranian Army boasted nine divisions, the 1st and 2nd of which enjoyed attached tank support. 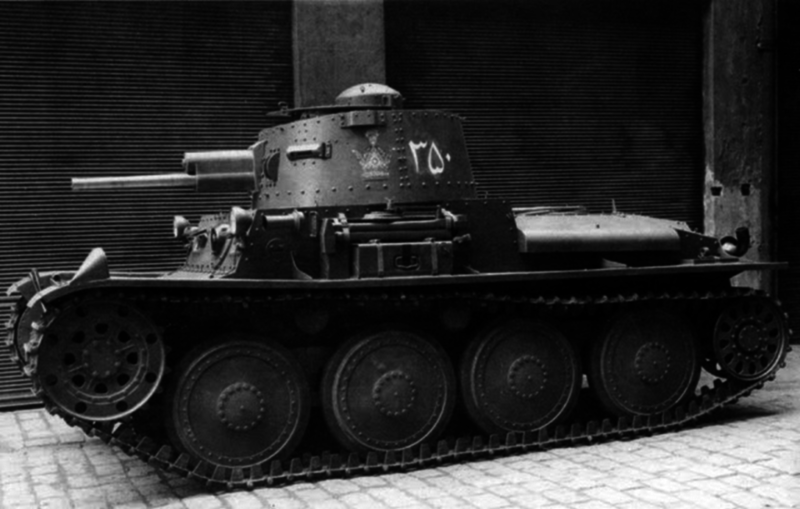 Iran had purchased 50 TNH tanks in the late 1930s. Better known by the German designation Panzer 38(t), these were relatively fast and well-armed with 37-millimeter guns that could tackle Allied light tanks. Iran also acquired 50 speedy AFV-IV tankettes, each armed with two machine guns. The Iranian army possessed an additional 100 armored cars, some also armed with 37-millimeter guns, plus roughly 120 75 and 100-millimeter howitzers and ample mortars, light anti-tank guns and machine guns. However, Iran’s ground forces lacked communications and logistical infrastructure. An entrenched and largely incompetent old guard denied its small cadre of Western-educated junior officers promotion to senior positions. The Iranian air force’s primary combat strength consisted of outdated British biplanes from the 1920s and early ’30s — 63 Hawker Audax and 34 Hawker Hind scout bombers and 24 Hawker Fury fighters stationed at airfields in Tehran, Ahvaz, Tabriz and Mashad. However, only 40 were in flyable condition in August 1941. Iran had acquired 10 modern P-40 Tomahawk monoplane fighters from the United States—but these were still sitting in crates awaiting assembly when hostilities began. Iran’s navy was more of a coast guard, with two 950-ton Italian-built gunboat-sloops, Palang and Babr, that sailed the Persian Gulf along with around 10 smaller patrol boats. For the invasion, code-named Operation Countenance, the United Kingdom’s assembled “Paiforce,” composed of the 8th and 10th Indian Infantry Divisions and an independent brigade each of armor, cavalry and infantry. The British armor consisted mostly of thinly-armored Mark IVb light tanks armed with.50 caliber Vickers machine gun in their turrets. The Royal Air Force comitted a squadron each of Hurricane fighters, Blenheim bombers and Vickers Vincent biplane scout bombers, as well as six Vickers Valentina transports. The most critical British objective was securing vital oil infrastructure in Khuzestan before it could be sabotaged. At 4:00 A.M. on Aug. 25, the British sloop HMS Shoreham opened fire on Palang moored off Abadan on the Arvand River separating Iran and Iraq. A single salvo of four-inch shells sank the sloop. The 24th Indian Infantry Brigade promptly landed in the port but encountered resistance from machine gun posts lining the wharves, which had to be silenced with naval gun fire. The Indian troops finally secured the oil refinery by 5:00 P.M.
To the east, another naval landing performed by the Australian merchant cruiser Kanimbla seized the port of Bandar-Shaphur by 8:30 A.M. 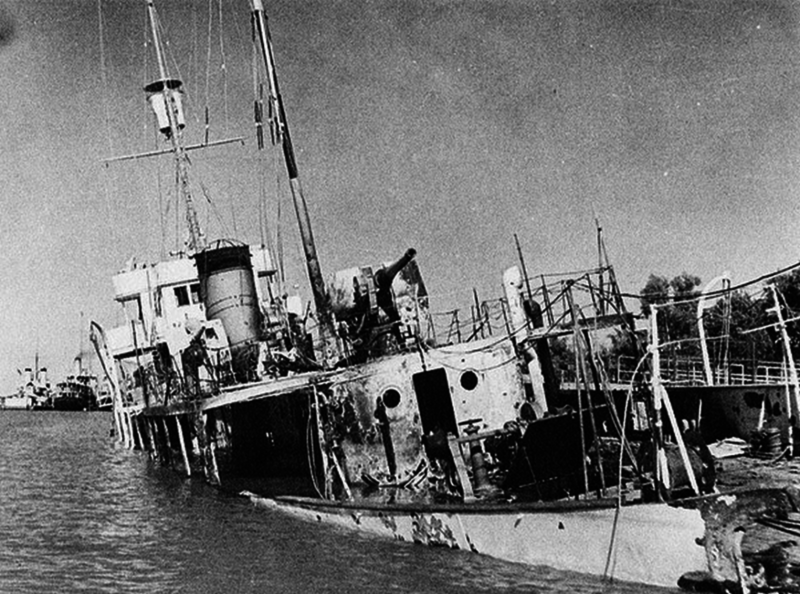 Nearby, the Australian sloop Yarra sank the Iranian gunboat Babr at the docks of Khorramshahr. Four German and three Italian freighters also fell into British hands. Rear Adm. Gholamali Bayandor, commander of the Iranian navy, raced to a radio station to organize a defense but was killed by Indian troops. His brother, serving in the three-boat Caspian flotilla, fell the same day fighting the Soviets. RAF Blenheim bombers struck major Iranian cities and airfields, killing civilians and destroying Iranian aircraft on the ground. However, some Iranian fighters did take off to fight back. Iran’s fastest fighter, the Fury, could attain only 222 miles per hour and was armed with two machine guns. By contrast, the British Hurricanes they encountered had a top speed of 340 miles per hour and packed eight wing-mounted machine guns. The Allied fighters shot down six Iranian biplanes without loss. Meanwhile, the 8th Indian Division rolled out of Basra and arrived on Aug. 27 at the Karun River near the city of Ahvaz. However, entrenched Iranian tanks, infantry and artillery under the steadfast Gen. Mohammad Shahbakhti repelled British forces on Aug. 28. East of Ahvaz, Valentia transport planes air-landed a company of infantry to secure Haftkel oilfield. To the north, the 10th Indian Division advanced eastward from the Iraqi border town of Khanaqin, but machine-gun, anti-tank and artillery fire at Gilan-e-Garb—gateway to the key Pai Tak pass—repulsed three light tank attacks. The British finally captured Gilan the next day, and the defenders of the pass fled that evening. The Indian column barreled through Pai Tak to capture the city of Shahabad, then rolled on towards the regional capital of Kheramshan. Meanwhile, the Soviet Union deployed three armies to invade northern Iran counting between them 40,000 troops and 1,000 tanks, most of them older T-26s. Though mounting a decent 45-millimeter gun, the T-26’s thin armor and slow speed resulted in many losses to German tanks. However, neither the two Iranian divisions in the sector, numbering 20,000 men together, had any tanks at all. The Red Air Force contributed an additional 409 fighters and bombers—and faced only 14 Audax and Hind biplanes based at Tabriz, many of which Soviet bombers destroyed on the ground. 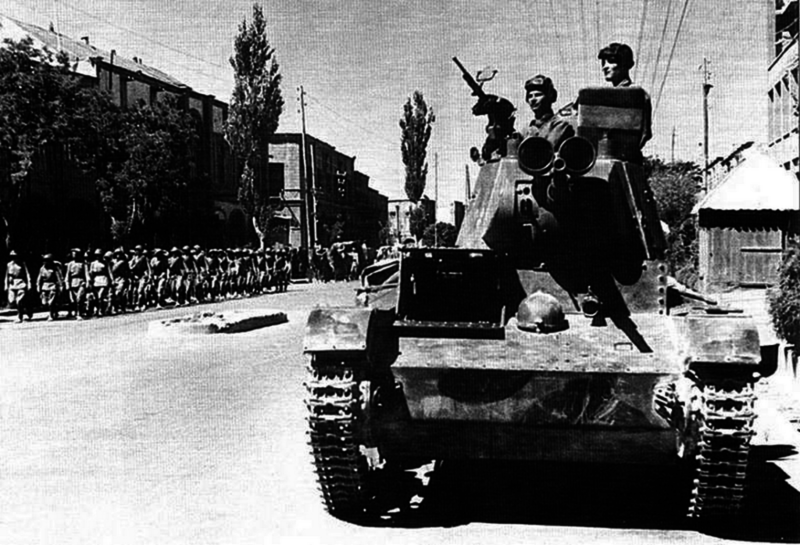 The 47th Army advanced out of Soviet Azerbaijan to seize the city of Jolfa, and from there marched towards the regional capital of Tabriz, defended by the 3rd Division. Despite possessing intel of the army’s progress, the Iranian army forces proved too disorganized to counterattack or destroy the vital bridges. Iranian bombers did attempt interdiction strikes, only to be intercepted by Soviet fighters. The 53rd Army skirted the west coast of the Caspian Sea, aiming to capture the city of Adabil. While Iranian troops from the 15th division dug in to take a stand there, their commander fled with his motorcade—and even diverted precious supply trucks to carry his extensive baggage. Both Adabil and Tabriz fell within 24 hours. On the coast of the Caspian Sea itself, the 44th Army swiftly seized the border port of Astara with covering fire from the Red Navy and then advance towards the city of Rasht and the nearby port of Bandar Pahlavi. There, Iranians troops finally made an effective stand, sinking barges in the harbor to block amphibious landings, while shooting back with 75-millimeter howitzers and anti-aircraft artillery. On the 27th, Soviet heavy bombers began round-the-clock bombardment of the city, while ground forces began grinding down the defenders, who finally surrendered on the 28th. Far to the East, the Soviet 53rd Army also attacked from Turkmenistan. VVS bombers destroyed Iranian aircraft on the ground at the Mashad Airport, while ground forces destroyed the 8,000-strong 15th Division and seized Mashad itself. If the surprise factor rendered the Iranian Army’s initial resistance ineffectual, the paralysis and disloyalty of its senior leaders sealed its fate. Many abandoned their troops in the field or failed to organize any resistance, perhaps due to a close relationship with the British or a disbelief that there was any point to resisting. Though commanders in Ahvaz and Bandar Phalavi did delay the Allied advance, the Iranian military was incapable of supporting them. The Shah expressed his surprise at the invasion to British officials and futilely tried to bargain them into abandoning the invasion. When the ruler learned that his chief of the armed forces, Gen. Ahmad Nakhjavanhad, was secretly plotting to surrender, he flew into a rage and began beating the general with his riding crop and tearing medals off his chest. The Shah nearly personally executed the man on the spot before Crown Prince Reza Phalavi calmed him down. Finally on Aug. 29 the Shah agreed to a ceasefire. The British had lost 22 dead and 42 wounded. The Soviets, 40 dead. Iran’s military and civilian deaths numbered 800. Reza sacked his British-sympathizing Prime Minister Ali Mansur and replaced him with Mohammad Ali Foroughi. However, Reza had earlier executed Foroughi’s son, which left the former prime minister with something of a grudge. When dispatched to negotiate with the British, Foroughi hinted that the Iranian people would be happy too see the Shah replaced. The Allies now demanded that Reza cut diplomatic ties with the Axis powers and hand over all German citizens into their custody. However, the Shah so resented the Allies that he stalled negotiations while he secretly organized the evacuation of the Germans across the Turkish border. This caused the Soviets to resume advancing on Tehran on Sept. 16. Meanwhile, nationalists in the Iranian air force mutinied. On the 16th, two renegade Fury fighters took off to attack a flight of five Soviet I-16s, which shot down one of the Furies over the Caspian Sea. The other crashed, out of fuel. As Soviet troops entered Tehran, Foroughi convinced the Shah to formally abdicate—and then engineered the accession of Reza Pahlavi to take his place. Pahlavi cooperated closely with the Allied occupation and ended relations with the Axis. The Allies promised they would withdraw their troops six months after the conclusion of the war with Germany. Iran became a major logistical hub that channeled nearly a third of the vital military aid the Western Allies transferred to the Soviet Union. The United States also built up a major presence, even supplying Lend-Lease equipment to Tehran to rebuild its military. Most famously, Roosevelt, Churchill and Stalin met at the Tehran Conference late in 1943 to discuss plans for the Allied landing in France and the post-war political division of the planet. As for Reza Shah, he died in exile in South Africa in 1944. Despite Iran’s newly cooperative stance, the British and Soviets commandeered much of Iran’s grain supplies for their own troops, causing hyperinflation and some starvation. German agents attempted to organize an anti-British insurgency among Iranian ethnic minorities, but were swiftly caught. Soviet historians also allege that Nazi spies parachuted into Iran to assassinate the Allied leaders at the Tehran conference. However, Moscow reneged on the promised withdrawal after Hitler’s defeat, and even built up two short-lived separatist republics on Iran’s border. It finally withdrew in May 1946 after Iran filed the first complaint in the history of the United Nations. None of the parties to the 1941 invasion of Iran come out looking very good. The Allied invaded a neutral country to secure vital oil fields and supply lines. Reza Shah badly miscalculated his political and military leverage. The Iranian army’s humiliating collapse in 1941 left Reza Pahlavi only more determined to build up Iranian military power after World War II—even while he continued his father’s repressive policies. Ironically, that repression would be the undoing of Reza Pahlavi’s reign, while the army he built proved instrumental in defending the Islamic Republic from Iraqi invasion.